The “Pivot and Pass Offensive Drill” and the “55 Second Offensive Drill” are the two most valuable drills that any offense could have to improve players’ performances and techniques. Besides the individual offensive techniques and skills that these drills teach and give players opportunities to improve on, the drills maximize time efficiency. Each drill is multi-faceted, with several techniques being able to be worked on at the same time by different participating players. The drills are game-realistic and competitive which brings out the best in players and also includes physical conditioning. This saves valuable practice time, so that these and other drills can be used more often for coaches to teach, coach, and correct players as well as for the players to learn and improve in the various skills that are needed for individual and team success. An invaluable offensive fundamental that is needed for a team to be successful in the execution of any offense is the crucial fundamental of all players being able to dribble against pressure, to pivot away from or around individual defensive pressure and then to be able to deliver the ball to an open teammate. This could be against man-to-man pressure, against half court zone or trap pressure or against full court defensive pressure. Teams must be able to move the ball both on the perimeter as well as to the inside to constantly attack defenders in the many various defenses that could be executed against them. 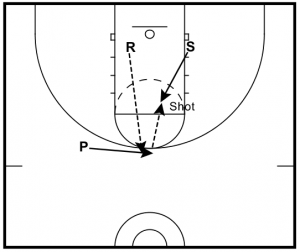 This drill should be utilized only after instilling the attitude to all players that the drill is a multi-purpose drill needed for each player to become a well-rounded and fundamentally sound basketball player. 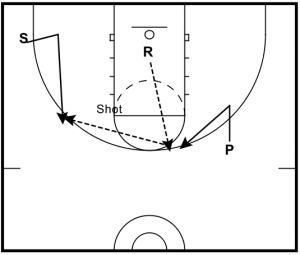 It is not just a dribbling, pivoting and passing drill for 01. 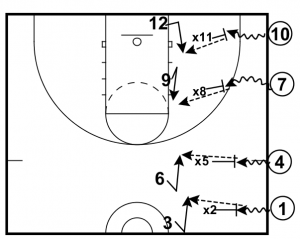 It is not just a defensive drill for X2. It also is not just a drill for 03 to catch the ball and to then work on shooting techniques. Instead, the “Pivot and Pass Offensive Drill” is an all encompassing offensive drill where all three players can work specifically on the offensive techniques that they individually need to improve on. After three rotations of players, all three players in each group will have worked on the three segments of the drills–the fundamentals of the dribbler/passer, of the defender and of the pass receiver/shooter. Because it is such a time-efficient and valuable drill and because it includes so many different fundamentals, this drill should be used more than once in every practice (for just short periods of time). The dribblers/passers (01, 04, 07, and 010 in Diagram 1) work on the obvious dribbling, pivoting, and passing techniques and skills that are required for them to be solid offensive ball handlers. The first technique to be worked on is the actual dribble as the dribbler approaches the defender. Dribbling quickly (but in a very controlled manner) with the head up in a semi-crouch stance is the first point of emphasis for this offensive player. Protecting the ball with the non-dribbling hand and dribbling with either hand is one of the most important skills and techniques that each dribbler should also work on. Another important skill for the ball handler is to work on the skill of passing the basketball with either hand. Still, another vital skill of the ball handler is being able to pivot with either foot as the pivot foot. Working on defending a dribbling ballhandler and pressuring him when the dribble is killed is very necessary for a team to have pressure on the basketball during a game. 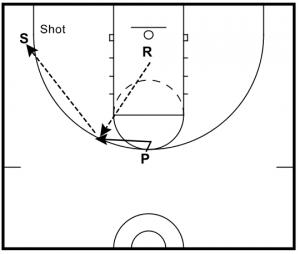 X2, X5, X8 and X11 are the first “on-the-ball defenders” in this drill. Being able to catch the ball on the move, making a quick pivot and shooting quickly are necessary for an offensive basketball team to be able to score. 03, 06, 09 and 012 are the first cutters/shooters in this drill. Notice that while 03 and 06 cut to their left to receive the passes, 09 and 012 cut from the left to their right. These directions can be alternated periodically. Diagram 1 illustrates the placement of an entire team so that each player in each three-man group can work on their specific techniques that are needed to be practiced. See Diagram 1. After a pre-designated time limit, all three offensive players rotate to their next position in the group. 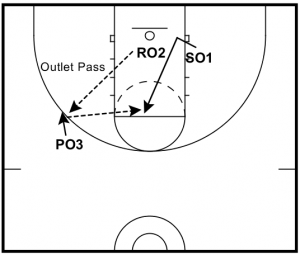 An example of the first rotation of the drill would be to have 01 rotate to become the next defender while 02 now becomes the next designated pass receiver/shooter. 03 rotates from being the first receiver/shooter to becoming the next designated dribbler/passer, also placing 06, 09 and 012 as the other new dribblers/passers. The newly designated defenders are X1, X4, X7 and X10. The newest pass receivers/shooters will be 02, 05, 08 and 011 after the first rotation of offensive personnel. A quota of a designated number of passes and shots in the set time limit can make the drill more accelerated and competitive. There could be a contest between the defenders and the dribblers/passers of how many “successful” completed passes and deflected passes take place in the time limit. “Winners” and “losers” could be defined with a small penalty given to the “losing player” after the conclusion of the drill. The designated pass receivers (03, 06, 09, 012 in Diagram 1) work first on the “pre-catch and pre-shooting stance.” The coaching staff constantly should be emphasizing to the (potential) shooter to “get your feet and hands ready!—to get behind the ball—give the passer a target!” See Diagram 1. In this scenario, the pass receivers/shooters (09 and 012) are breaking to their right and the imaginary basket is directly behind the passers at the sideline. Even before the actual catch of the basketball, the pass receiver should try to already have his “inside shoulder” (shoulder closest to the basket, which is the left shoulder in this example) facing the basket and to have both his “guide hand” and “shooting hand” up (as if he is already shooting the ball). With the “shooting hand” in that position, it gives a good target to the passer. The pass-receiver should always pivot off of the heel of his “inside foot” (the foot closest to the basket, which is the left heel in this example). If the pass-receiver is in a stationary position, he can start with the “inside heel” already touching the floor and the remaining portion of that foot not yet touching the floor. If the pass receiver is on the move, he might have to “chop up his steps” in order to time the “inside heel” hitting the floor (to pivot) just as the ball hits the palm of the “shooting hand.” From there, the heel being planted first will stop the pass-receiver’s forward momentum of his cut toward the passer. After the shot, the shooter should be able to rise straight up and come back straight down and not “float” in either direction. Stopping all of the momentum from the shooter’s cut before he shoots the ball will greatly improve shooting accuracy. Each shooter (03, 06, 09, and 012) shoots as if the original passer (01, 04, 07, and 010) is the basket, so that the ball is returned for that passer to restart working on his skills and techniques. See Diagram 1. Once the momentum of the cutter is stopped, the inside heel actually will allow for a smooth, easy and complete pivot toward the basket, as the shooter swings his free (outside foot and leg) around so that he is completely “squared up” to the basket. 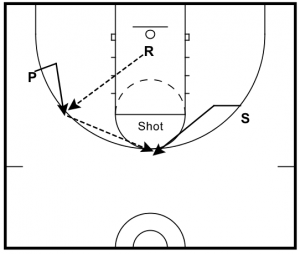 In this offensive drill, the pass/receiver/shooter “shoots” the ball at an imaginary basket back to the original passer. The passer (01, 04, 07, and 010) is now quickly ready to resume working on his technique of passing to the shooter again, so the shooter can again quickly work on the “foot and handwork” part of his shooting technique (beginning with a new dribble and jump stop. The men in the middle of the drill (X2, X5, X8, and X11 in Diagram 1) utilize the drill as a defensive drill, who initially are guarding the dribblers/passers (01, 04, 07 and 010). Effort and the emphasis on defensive fundamentals (such as proper stance and other various defensive techniques) should not be taken lightly by players or the coaching staff, as the drill is stressed to them as being a defensive fundamental drill. These defensive players work on defensive techniques only on the original dribbler/passer and not on the pass receiver/shooter. 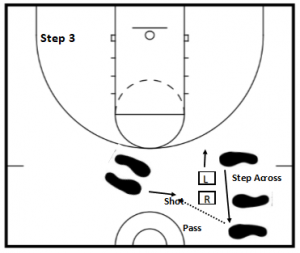 The specific footwork and techniques of each passer/dribbler are demonstrated in the four steps are shown in Diagrams 2 through 5. Step 1 of the “Pivot and Pass” Technique—As the dribbler approaches the defender and kills his dribble, the dribbler should take a small bunny hop and land simultaneously on both feet. This allows the “killed dribbler” to use either foot as the pivot foot. See Diagram 2. Step 2 of the “Pivot and Pass” Technique —If the passer wants to attack the defender by passing laterally around the defender’s left side, the dribbler should land and make the right foot (the foot directly facing the defender’s left foot) the free foot and therefore make his left foot the actual pivot foot. This makes the passer’s right foot the foot that can laterally step toward the outside of the defender’s left foot. As this is taking place, the passer should protect the ball by firmly holding the ball with both hands with the ball held behind the knee of the free knee (the right knee in this example). If the passer’s free foot is laterally outside the defender’s foot, the passer then could “fake low and go high” or “fake high and go low” (passing high over the defender’s left hand or passing low under the defender’s hand). Constantly tell the dribbler-turned-passer to “protect the ball behind the knee” and to “step due east or due west.” This means that the dribbler/passer should constantly attack the flanks of the defender by stepping laterally around the defender and not toward the defender. See Diagram 3. Step 3 of the “Pivot and Pass” Technique —If the on-the-ball defender counters the dribbler’s first lateral attack, the dribbler should “rip the ball low and hard across his shoe tops” as he steps with a front pivot across the face of the defender to laterally attack the defender on the opposite side (in this scenario, it is the defender’s right side). The ball ends up on the inside of the passer’s knee of the free leg (the right knee in the diagrams). If the passer’s free foot (right) gets outside defender’s (right) foot, the passer looks to pass the ball around the defender (“fake high and go low” or “fake low and go high”) on the opposite side from the initial side of attack. Again, coaches should strongly emphasize to the pivoting passer to protect the ball behind the “free knee” (right) and again step “due west and/or due east” in the lateral attacks on the ball defender. See Diagram 4. Step 4 of the “Pivot and Pass” Technique —If the ball defender reacts quickly and takes this second technique away, coaches should emphasize to the offensive player to remain in the semi-crouch stance, to then quickly reverse-pivot off of the same (left) pivot foot and to then attack the ball defender’s original (left) lateral side. The ball should now be back behind the outside of the knee of the free (right) foot. After the 55 seconds expires, the dribbling/pivoting/passing player (01) switches to the defensive station, while the first defender (X2) switches to work at the pass-receiving station/shooting station, and the first pass-receiver/shooter (03) rotates to the dribbling/pivoting/passing station. 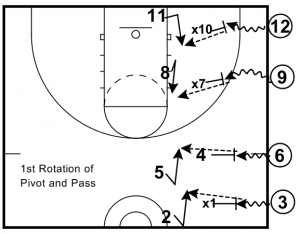 This rotation should take less than 5 seconds and the drill starts again. 55 seconds later comes the next rotation of the three players. 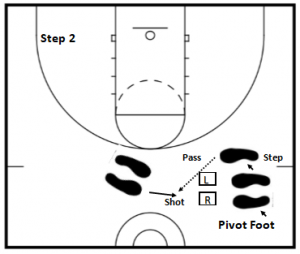 After the third 55 second time frame has concluded, coaches can start the second round with all offensive dribblers using a different dribbling hand and making the right foot as the new pivot foot. Three minutes will allow for all three players to rotate through each position again. In just six minutes, three players have each had almost two minutes of concentrated work on all three stations—the dribbling, pivoting, and passing phase, the defensive phase, and also the pass-catching and shooting phase. See Diagram 6. Every offensive/shooting and shooting drill has definite characteristics, but all drills must be “game-realistic.” To make these drills as “game-realistic” as possible, coaches should incorporate as many types of pressures (on the players) as possible. They should try to incorporate “success” and “competition” pressures–trying to beat other players, other squads, or other types of opposition. The other types of opposition could be pre-set standards and can be time on the clock. Obviously, accuracy should be stressed in all shooting drills, but also “quantity” should be emphasized. All shooters, passers, and rebounders should always go at “game speed” in practice because they will be going at that speed in the games. Coaches should continually accelerate rebounders, passers, and shooters in each and every shooting drill. They should have pre-set “quantity AND quality” standards set for each shooting drill used. That increases the game realism, because each individual is trying to succeed not only for himself, but for his team (or group or squad). Every shooting drill has a pre-set standard of a specific number of attempts the shooter must take as well as a standard of how many shots he should make. Again, this forces the tempo and intensity level up for each shooting drill used. Game realism also means rewards for the winners and penalties for not winning. None of the penalties are harsh or hard, but they are a true penalty. They could be some type of a running penalty, some pushups, or sit-ups. Competing against the clock is always beneficial, because everyone has a common opponent and measuring stick. Every drill must also be as time-efficient as possible, because no practice time can afford to be wasted. This can be accomplished by incorporating other offensive techniques and fundamentals into each shooting drill, such as passing, rebounding, cutting, coming off of screens, catching, pivoting, as well as the shooting. Coaching staffs should incorporate the spots where the player will most likely get those shots in games, as well as the types of passes used in games. Also coaches should place the passers where they will pass the ball in game situations. Shooters should start in their initial locations and the shooters are required to cut and break to the spots where they most likely will take the shots in games. Passers are required to use the same type of passes they will use in a game, always at game speed. Passers are forced to quickly AND accurately make the appropriate passes that they will make in a game. Sometimes have managers or coaches can have their hands up in front of the shooters to act as dummy defenders. Rebounders are encouraged to aggressively offensively rebound the basketball before making quick and accurate outlet passes as they would in a real game. If the coach constantly emphasizes the speed and intensity needed, other drills that follow in that day’s practice will naturally pick up the same speed and intensity levels that are required for those drills to be successful. 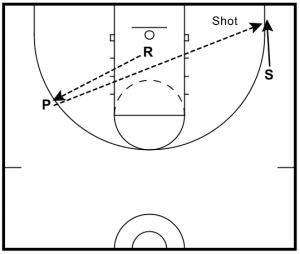 Another by-product from these shooting drills can be conditioning. If everyone works at meeting the “quantity and quality” standards that have been set, every player’s physical conditioning will also improve. In the many different types of shooting drills that incorporate the “55 Second Offensive/Shooting Drill” theme, there are three players involved. See Diagram 7. One player is the designated “Passer” (02), one the designated “Shooter” (03), and one is the “Rebounder” (01). After 55 seconds, all three players rotate over one designation and the drill is executed again. 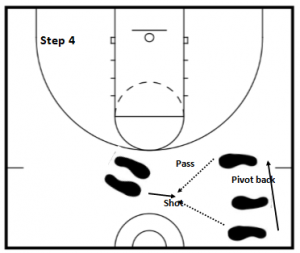 The “Passer” rotates to the “Shooter,” the “Shooter” rotates to the “Rebounder” station and the “Rebounder” rotates to become the next “Passer.” See Diagram 8. 55 seconds later, the three players then rotate for the last time (on that side of the court.) See Diagram 9. There should not be more than 5 seconds for the transition and the player rotation. In three short minutes, each player receives almost one minute of concentrated work on offensive skills of passing, catching and shooting, and rebounding and outlet passing. 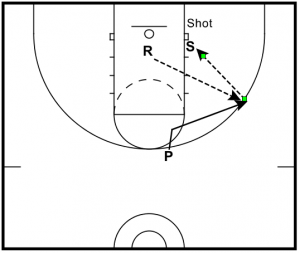 The best rotation is from “Passer” to “Shooter” to “Rebounder” and on to a different shooting location, where the three-man rotation starts again. 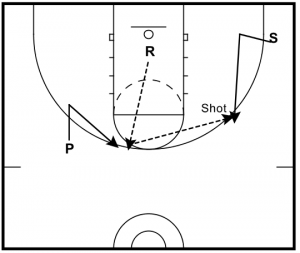 It is important to notice that this drill is not only called the “55 Second Offensive/Shooting Drill to demonstrate the drill lasts 55 seconds (before there is a rotation), but to also emphasize that the drill is not just a shooting drill, but a rebounding and outlet passing drill, a cutting and pass receiving drill, and a passing drill. Otherwise this would mean that the remaining two players in the drill other than the shooter are not as important and do not need to work as hard at the various fundamentals they need to be working on. On the contrary, the two players that are not shooting in this drill are equally important and should work just as hard as the shooter in the drill. 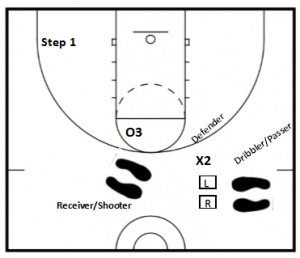 The locations of the designated “Shooters” and the placement of the designated “Passers” can vary to fit the specific offense’s needs, while the “Rebounders” obviously always remain near the basket to grab the rebound, outside pivot (away from the imaginary defense or against a manager), and make the outlet pass to the “Passer.” See Diagrams 12 thru 16 for just some of the possible combinations of passing and shooting locations the drill could utilize on just one side of the court (even though the drills could and should be utilized on both sides of the court). These passing and shooting spots should be determined by the coaching staff analyzing the particular offense(s) used and where passes and shots are generated from those offenses. The “Pivot and Pass Offensive Drill” and the “55 Second Offensive Drill” are the two most valuable drills a coaching staff could use because they allow coaches an excellent opportunity to not only teach the techniques the proper way, but they give each player game realistic opportunities to learn the skills, to practice the skills and to improve those necessary skills. Each drill is multi-faceted, with several techniques being able to be worked on at the same time by different participating players. The drills are game-realistic and competitive which brings out the best in players and can then include physical conditioning. This saves valuable time in the practices, so that these and other drills can be used more often for coaches to teach and coach players as well as for the players to learn and improve in the various skills that are needed for individual and team success. Coach Kimble held the Head Basketball Coaching position at Deland-Weldon (IL) High School for five years (91-43) that included 2 Regional Championships, 2 Regional Runner-Ups and 1 Sectional Tournament Runner-up. He then moved to Dunlap (IL) High School (90-45) with 2 Regional Runners-up, 1 Regional, 1 Sectional and 1 Super-Sectional Championship and a final 2nd Place Finish in the Illinois Class A State Tournament. He was an Assistant Basketball Coach at Central Florida Community College in Ocala, FL for 1 year before becoming Offensive Coordinator and then Associate Head Coach for 3 additional years He then was the Head Basketball Coach at Crestview (FL) High School for 10 years, averaging over 16 wins per season. I don’t know if you have videos that illustrate these techniques but I am a visionary learner when it comes to these things. If it is possible please include this option in your system.